While yesterday I included some Etsy holiday gift and decor ideas, I came across this today on World Changing and thought it was worth sharing with you. Recently for my wedding, a great gift we got was a gift certificate from JustGive, which allows you to donate the money to whichever organization you choose. We chose to donate to CPAWS, a Canadian organization that protects fragile/valuable land by turning them into parkland. Their latest triumph was hugely expanding the wondrous and fragile Nahani River National Park. Anyway, I just think maybe this is another approach, and while not for everybody it may ring really true with someone on your list. 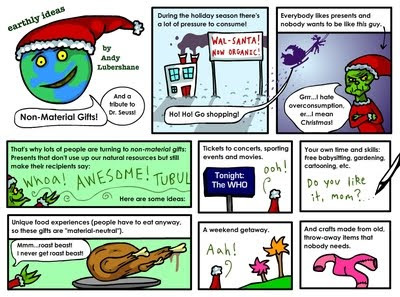 Read on for a few other really good, non-materialistic ideas! By the way, if you liked this, its part of a whole series. Check it out on World Changing.